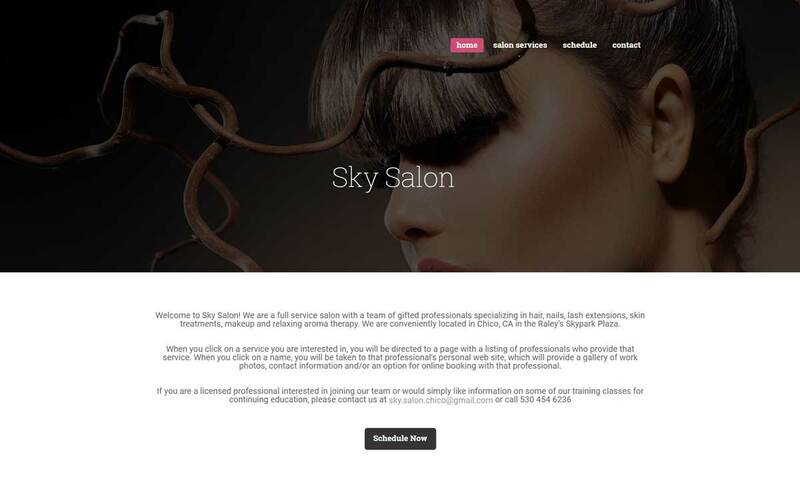 We are pleased to announce that after building their website we will be working with Sky Salon to increase their google ranking and traffic to their site. They are a full service salon specializing hair cuts, nails, lash extensions, makeup, skin and relaxation treatments. They have a really talented staff of professionals that can easily be booked through their site here. Our staff has tried them out and say that it’s a great experience. Image optimization is always important to page speed, so we did our best to resize and compress all the lovely photos of great looking hair cuts. Asides from making the images load fast it is also a good idea to rename the files and sprinkle some keywords into them along with the alt descriptions. However, you don’t want to get a smack down from google by being overly keyword dense, so we make sure that the names and alts are relevant to the image and not just a repetition of keywords. Another thing that is important for any new businesses is to create and update their local listings. We are still working on that currently, but plan to have them listed on all major local listing sites by the end of the month. These listings can not only help your search rank, but can help people reach you through the listings themselves. As time goes on we will be generating new optimized copy as well as optimizing copy delivered to us by the client. Combine that with social outreach and organic back link building and we hope to have them top the SERP on at a local level soon.